Greetings space cadets. Here is another update from my IGN Blog. Originally posted the day after the movies release. Just a quick one, I’ve been to see Apollo 18 this week. I had been really looking forward to seeing this movie since I first seen adverts for it, and I was disappointed when its release was delayed earlier in the year. I think it was suppose be be out in what, February, or April time, I vaguely remember some one telling me that they had just finished shoot it so it was not ready. But that’s not important, I finally got to see it now. Unfortunately after seeing this movie I was quite disappointed. When I came away from the cinema I felt like the story could have been ‘more’. Don’t get me wrong I still enjoyed it, and what they did do was good, but I was left feeling it needed a little ‘more’. I don’t know if they made a lot of changes to the story during production (in a Star Trek The Motion Picture style) or if they had put out some other clips to miss lead audiences in preparation for the release, but I remember watching a clip of them finding an alien body. This might have been part of the marketing and in a way after seeing it I’m pleased they did not go with this, but it does make me think that some of the delays may have been to rewrite. You can research that, the 3G signal for my iPad in my office where I type these ramblings is really poor. I did enjoy the visual style of the movie, made to look like it was put together from all the archive footage that we are so used to seeing from this era. It wouldn’t surprise me if so e of it was stock from the real flights lots of the clips did look identical to footage that I have seen in many documentaries. Which is what the film makers want, as it is meant to be footage that was classified and has been finally realised. The movie its self is quite short, less than 90 minuets. I was a little worried that this movie might have been like that Paranormal Activity rubbish, where you site for a couple of hours to watch the movies and there are only about 90 seconds in the entire thing that are actually interesting but thankfully there are plenty of moments of suspense throughout to keep you glued and plenty of moments that made even me jump. So in wrapping up, you should still go and see this movie, that is if you can as the cinemas are pulling it from there schedules as it’s not doing so well. But I’m sure the Blu-ray will be out in a couple of months and hopefully there will be some Commentaries, and some other special features. Apollo 18 – 6/10 on the ‘Bonniwae’ scale. 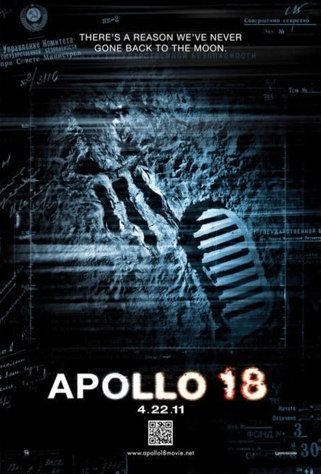 Apollo 18 Reviewed by DR Ravenholm on August 1, 2012 .